Shout out to all UConn Stamford students and families - Family Weekend at UConn is upon us! 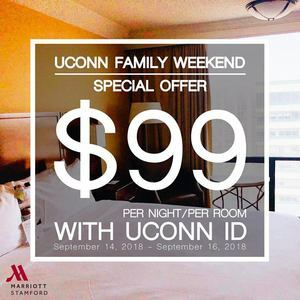 The Stamford Marriott Hotel & Spa is offering a weekend deal for UConn Family Day on Saturday, September 15th! Don't have a need for accommodations because you're a local? Tell your friends and family who may be traveling that they can stay in a first-class hotel and spa in the heart of downtown Stamford on Friday, September 14 and/or Saturday, September 15 for just $99! Complimentary overnight self-parking is included. "We are so excited to meet the Undergraduate and Graduate students and families of UConn and share some HUSKY PRIDE," says the team at Stamford Marriott Hotel & Spa.